Alice in Wonderland and The Fighter are among the seven films that remain in the makeup competition of the 83rd Academy Awards. The additional titles are Barney's Version, Jonah Hex, True Grit, The Way Back andThe Wolfman. On Jan. 22, members of the Academy's Makeup Branch will be invited to view 10-minute excerpts from each of the shortlisted films. Following the screenings, members will vote to nominate three films for Oscar consideration. The 83rd Academy Awards nominations will be announced Jan. 25. The Way Back: Appears that the makeup consists mainly of horrible effects of brutal weather and aging of actors. A possibility, but it has been seen/done before. The Wolfman: Transformations into frightening creatures? Yeah, I think this should make the final three. The Fighter: Boxing wounds? Uh, been done before and I don't see anything ground-breaking here. Alice in Wonderland: I think I enjoyed the makeup more than the film itself, but I wonder how much was makeup and how much was CG? Still, one of my picks for final three. 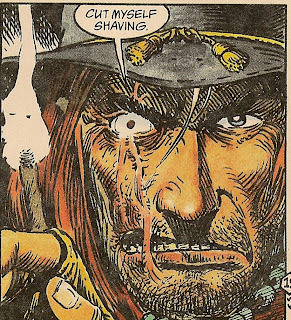 Jonah Hex: I'm not being partial here, but I know some of the new techniques they developed for Brolin's makeup and I think they pulled off an entire film with very good makeup. Last of the final three. True Grit: Last of the bunch and best film of the year (that I have seen) including best actor. However, there is nothing here, makeup-wise, that we haven't seen in any other film nominated. My picks? Jonah Hex, The Wolfman, Alice in Wonderland. We'll find out on the 25th. Four Color Promises is a new blog that covers comic book ads, and you can't have too many of those kind of posts amongst the intrawebz. Drop on over and give Shannon a look-see and tell 'em I sent ya. 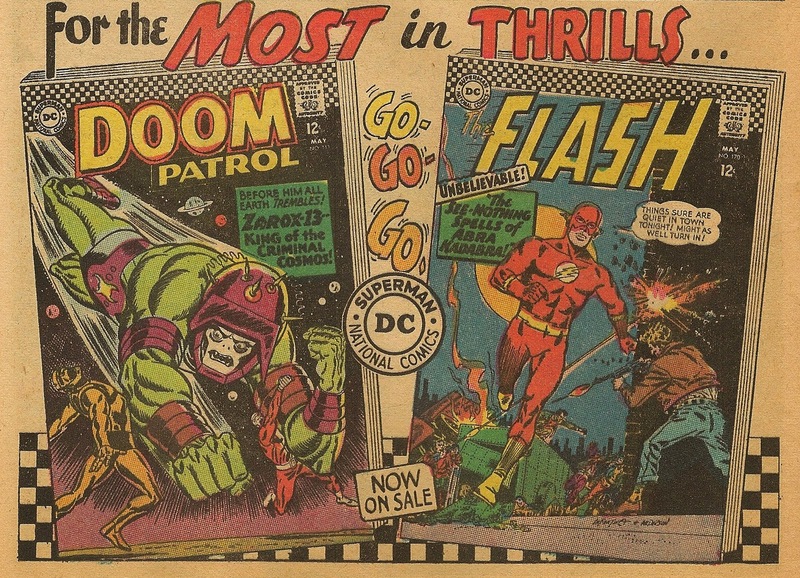 I still love these House ads because they would throw two completely different books together in one ad. If they did this today, what two books could you see in an ad like this? 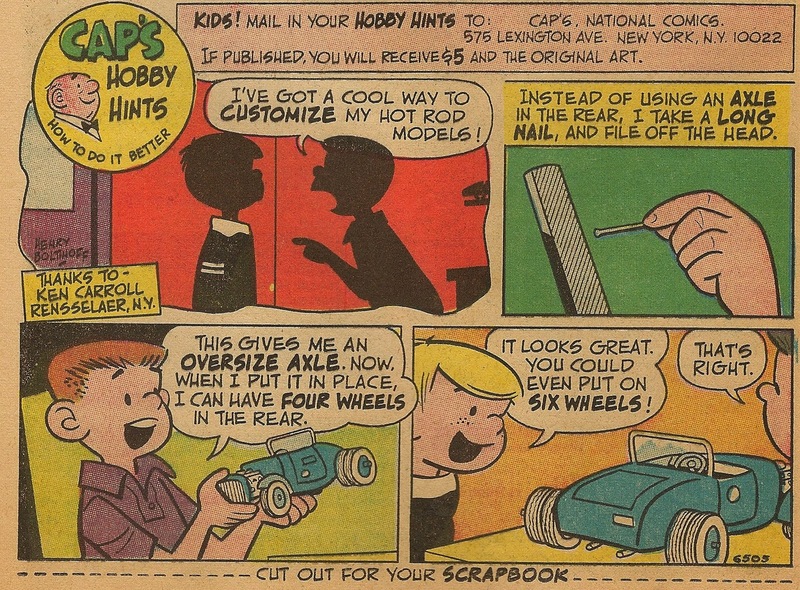 For an exciting toy this is a pretty dull ad. I never remember seeing a Russian G.I. Joe. 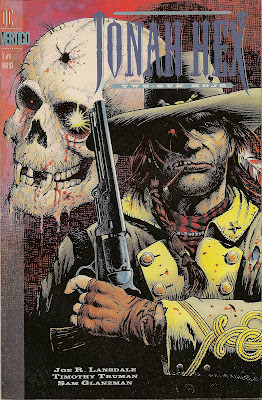 Jonah Hex movie in the news once again! 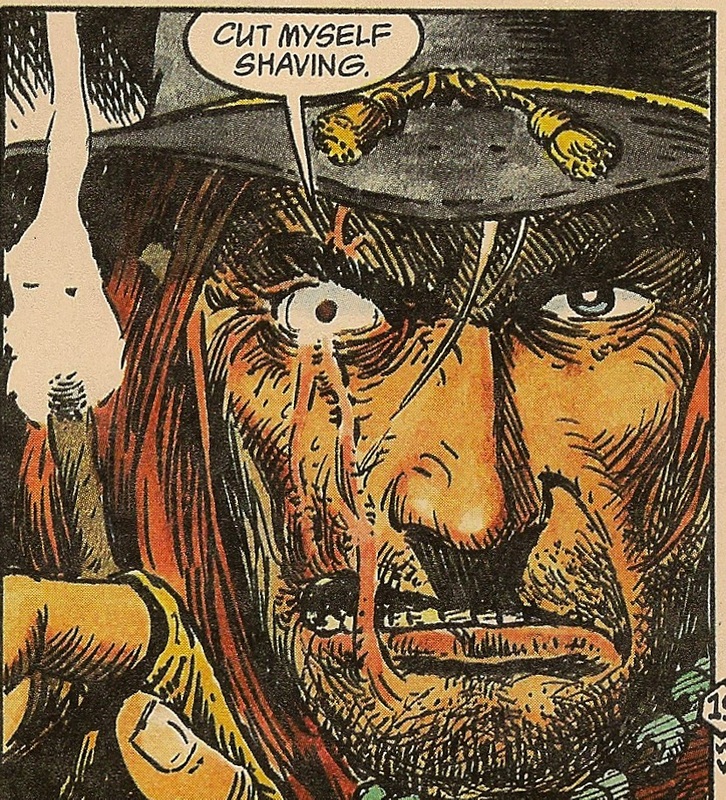 Yup, the words JONAH HEX are being uttered again and at this time of year it can only mean one thing.... awards. Not just ANY awards.... THE RAZZIES!!! Start rooting for your favorite bad movie of 2010 because the Golden Raspberry Award (aka Razzie) nominations will be announced Jan. 24. A shortlist of possible Worst Picture nominees has just been released. That is some tough competition. This phase of Jonah Hex is a hard one to pin down regarding which issue it starts and what issues it covers, but of course, it ends with the end of the Jonah Hex book. It does overlap with the Tragic Hex in many ways and it may actually be more tied to Fleisher's storytelling than any actual change in Jonah Hex himself. In issue #50, not only did Fleisher introduce Emmy Lou Hartley, a woman that Jonah would shun and then turn to, he started a chain of events that would reveal some more of Jonah's past as well as build up a group of people that we would start to care about. It took Jonah from a lone gunman with a friend-of-the-month-who-winds-up-dead-or-betraying-Hex to a man with a circle of influence that would shape and direct his life. Fleisher started weaving stories together and actually had some story arcs end in the middle of the issue. The exit of Mei Ling tied in with the return of Emmy Lou and then melded into the abduction of Mei Ling. Mei Ling leaving again opened the door for Emmy Lou once again and all of that tied into the Cassie Wainwright revenge storyline that also morphed into the crazy Manitou and slowly ended up with Jonah in jail. Adrian Sterling surfaced once Emmy was abducted and in some stories we had a page of Jonah, a page of Mei Ling, a page of Emmy, a page of J.D. Hart, and a page of Adrian. While it seemed like a lot was happening, it also seemed like nothing was happening and oddly enough, I loved it. The complex Hex was much more that a book about a scarred bounty hunter, it became the story of his estranged wife, his blonde girlfriend, his Marshall friend that was putting the moves on his wife, two enemies teaming up against him, another crazed lunatic showing up, and girl after girl after girl falling in love with him and he in love with them. This last point probably is the main point in the complex Hex. The man's life was a whirlwind and I'm sure that during this time his head and heart were a whirlwind as well. His wife leaves, memories of his dead fiance are resurrected and it appears that every blonde in the old west was throwing themselves at him. 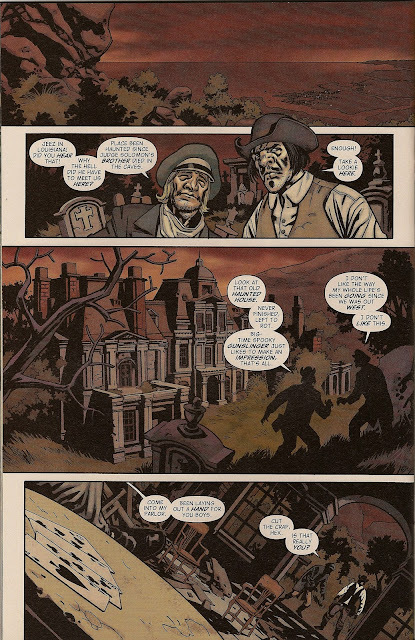 Hex even ends up leaving "the West" and stay in New Orleans for some time, attempting to 'blend in' to a society, while somewhat uproarious by today's standards, was still decades more refined than anything Jonah had encountered. Jonah, I think, has learned to suppress his emotions for a very long time as a defense against his father. Mei Ling tapped into those emotions and Jonah started living by his heart rather than his head. Of course, we see the disaster that became of their relationship, so Jonah goes back to living with his head. Until, of course, those emotions start stirring within him once again with the vendetta against the killers of Cassie Wainwright. It's at this point Jonah re-channels his emotions, moving them from his heart to, shall we say, an organ much lower in the scheme of things. This leads him to Emmy Lou and eventually Adrian Sterling. With Adrian, Jonah suppresses everything that his is, except for his hat, and tries to fit into society. All of this for a relationship that on Adrian's side is a weapon against her former fiance and her father and on Jonah's side is a weak attempt to put away his gun-filled lifestyle (such as what Mei Ling requested of him) in an attempt to convince himself that he was in love when in reality he is in lust. The Complex Hex is a Hex that entails not only an erratic and unorthodox manner of story-telling, but it entails an erratic and unorthodox manner of looking at the old West and the heart of a ruthless man. The Return of Bruce Wayne #3 "The Bones of Bristol Bay" and #4 "Dark Knight, Dark Rider"
"The Bones of Bristol Bay"
We are somewhere along a coast and we meet two men in a graveyard. They are discussing that they have to meet a man here in a huge haunted house that has been haunted since Judge Solomon's brother died in the caves. They speak of the mansion never having been finished and how their lives have been messed up since going out west. They also talk of having to meet a big-time spooky gunslinger. As they approach the mansion, a voice beckons them into the parlor and we see a hand of cards, Aces and eights, on a table. The man, Jonah Hex, tosses a joker toward the table and tells the men he figures they're men of reason since they had the guts to meet him on cursed and haunted ground. The men state that they have brought down some sort of fury upon their heads, it never tires, it never stops. They present a primitive Batarang, saying that it was dug out of one of their shoulders. Their boss will pay triple of what is in the bag they brought if Hex can kill this thing that is after them. Then they ask is Hex is ready to prove that he is the best as everyone says that he is. The next page reveals Bruce Wayne/Batman is 1800's garb, astride a horse. 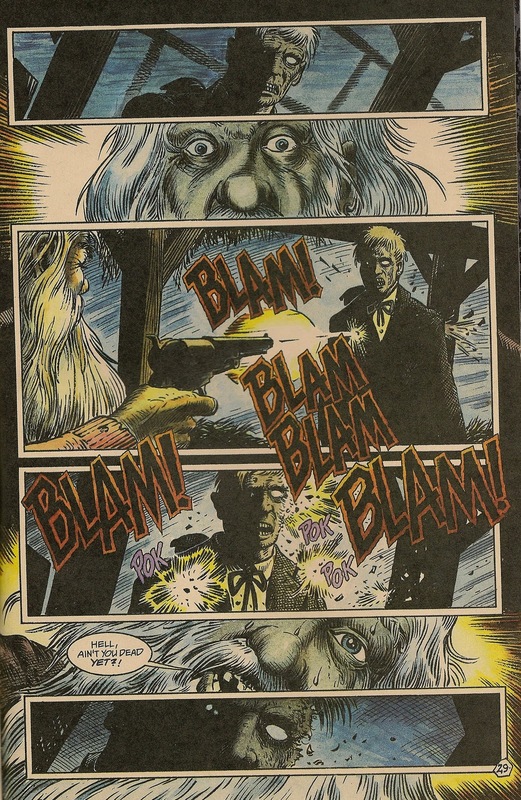 Timeline - With the reveal of the Deadman's hand, I'm somewhat quick to assume that this takes place after the death of Wild Bill Hickok but there is no direct reference to a Deadman's hand so that is no help. I would probably have to know more about the timeline of the series to pin this one down more precisely. The hand of cards reveals more as told in the Annotation at Comics Alliance. Page 30: The mansion here is Wayne Manor -- Judge Solomon Wayne and his brother Joshua had purchased it unfinished from Van Derm, largely so they could use the caves as part of the Underground Railroad. Joshua died, as referenced here, playing a masked avenger role to save some escaping slaves. Note Hex's hand of cards - 8A8A, or "H.A.H.A." (with H as the 8th letter of the alphabet), the Joker's Dead Man's Hand from "Batman R.I.P." -- named such, by the way, for being the hand Wild Bill Hickok had in poker when he got offed.. It's worth noting, though, that here the cards are all black, rather than black and red as in the Joker's hand -- perhaps representing that instead of the punchline of life and death, we're dealing with the death that is life? Page 31 : Of course, the first panel here makes the Joker allusion utterly blatant. 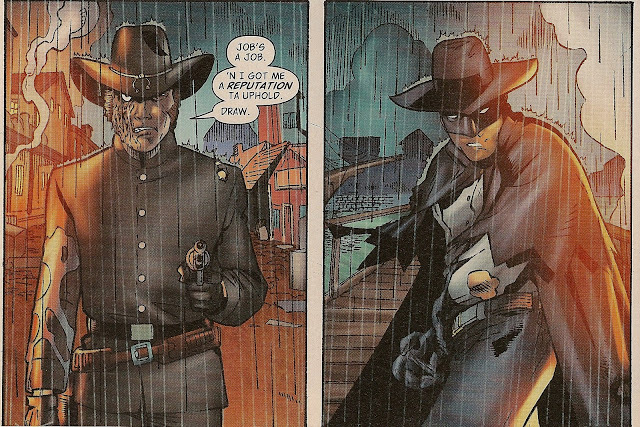 One thing I especially enjoyed was the juxtaposition of Jonah Hex's scar next to the iconic Joker card. For some reason it gave me chills. It's a nice cameo with some nice artwork. I'll be covering this issue a little more indepth because Jonah appears throughout it more. The keyword is "appears". The story starts with the gents from last issue slaughtering a family, hanging the father, killing the young son, and making off with the daughter and a small box with a bat symbol on it. They ride off, leaving the mother holding her dead son, her husband's corpse hanging in a tree as the rain falls. She prays for a dark avenging angel to rescue her and we see Bruce Wayne/Batman appear. Gotham City: The two men have been joined by a third (who was also at the house) and Jonah Hex. They are explaining how they encountered this bat creature back west and that they have hired Hex to work for "Monsewer Sauvage". 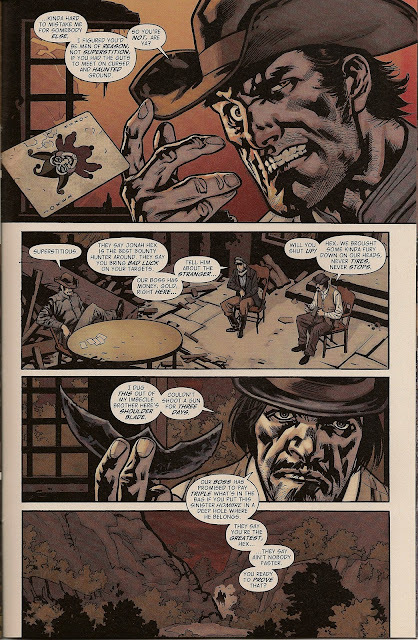 They enter a gambling hall and introduce Hex to Vandal Savage. Savage is pouring himself a stiff dose of laudanum because, while he can't die, the cancer he has is still eating him alive. Savage asks Hex if he cut himself shaving (nice little nod to the original WWT tales, there) and says that he would offer Hex some, but doesn't want to ruin Hex's aim. Hex declines anyway and clarifies that he has been hired to kill a mystery man, at least that is all he could understand from Savage's lackys. Savage explains about a cowboy in black that have been giving Chuck and Lucky problems and Savage wants an end put to it since they have work to do. Hex comments that Savage is paying and then asks about what is behind a nearby door since it smells like they are burning sage and something else it that other room. Savage replies that it's complicated and it has something to do with Bonaparte. Just then the door opens and Midnight Horse stumbles out (thank you, Comics Alliance for helping me with that part). Horse remarks that he is no longer needed but if the box is opened it will be the end of the world. Jonah states "End of the world's extra" as Chuck tosses a roll of bills to him. Savage says that there is more, always more, as soon as that demon is put down. We cut to outside the gambling hall in the rain (however, the artwork makes it appear to be a small western town, rather than large Gotham City). Four men confront Batman and they end up with batarangs in their shooting arms. Batman ends up on the roof, taking out a guard. Inside, Horse shouts that HE is coming for the box, causing Hex to ask what has Horse been chewing. Savage replies that Hex can have either money or answers, not both. Savage tells Chuck and Lucky to bring in the mystery man so Hex can kill him and orders Horse back into the room to open the box. Now that seems weird, you hire the best bounty hunter in the world and send to grunts out to drag in a mysterious bat-man so the bounty hunter can shoot him. I would send out Hex to earn his dang money! 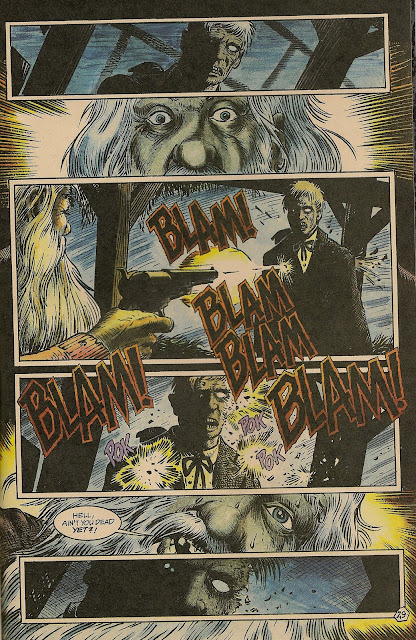 Hex says that they can spare all the hoodoo, just point him to the target (!?!?!? He's a bounty HUNTER!) so he can get out of there. Inside the room is Thomas Wayne(? ), questioning the daughter from earlier, getting her to open the box. Horse enters the room, there is an argument and Wayne shoots and kills Horse, sending him crashing through the door and back into the room with Savage and Hex. Savage asks Hex to help him fill some old saddlebags with gold bars. Wayne exits the room, holding the box and dragging the girl with him. Outside, Chuck and Lucky are tracking down Batman in the fog. One of them gets jerked up into the shadows and the other turns and shoots the third thug as he's trying to help. Suddenly Batman jumps out of the fog (we then learn they are inside (?)) and kicks the remaining thug down into the gambling tables. Outside, Savage, the girl, the box, and Wayne are making a break for it in a covered wagon through the streets of Gotham. Hex is riding alongside on his horse. Batman swoops down, landing on the wagon. Hex shoots at Batman, hitting him in the left shoulder, Batman throws a batarang, hitting Hex in the right arm and knocking him off his horse. The wagon is careening towards the docks where Alan Wayne is contemplating suicide and as Thomas Wayne battles Batman, Savage is fighting the girl and then the whole shooting match overturns on the dock, narrowly missing Alan Wayne and crashes into the water. 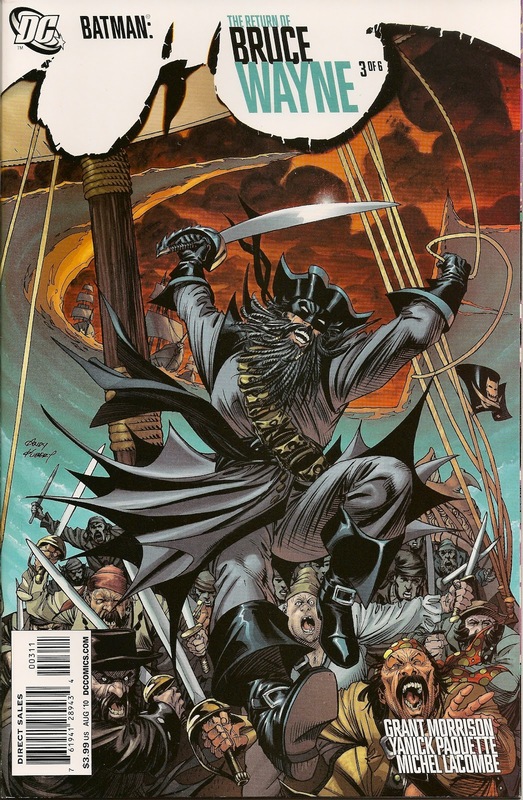 Batman encounters Alan Wayne and the girl, the girl opens the box by whistling to it, Vandal Savage knocks out Thomas Wayne before he can shoot everyone, Batman beats the crap out of Thomas Wayne as Wayne calls out to Hex. and shoots Batman, causing him to fall off the dock into the water, never to surface. 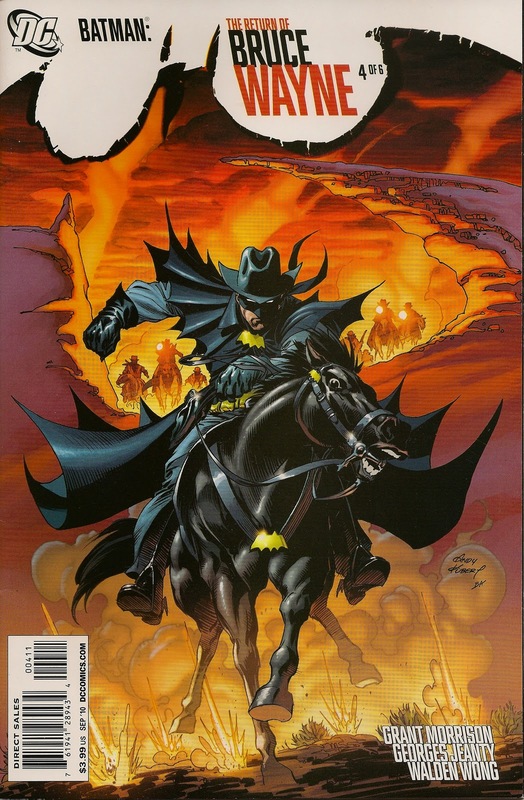 There is closing dialogue from Alan Wayne explaining that Hex rode off to meet his destiny, we see Jonah Hex riding into the sunset, looking at a batarang, his saddlebags stuffed with the gold bars. A few bars lay in the sand behind him and we are unsure if he has tossed them aside or they have accidentally fallen out. Jonah's Injuries - Batarang in right bicep. Timeline - Unclear, right after last issue. It's hard to rate the 4th issue of a 6 part series when you don't follow the series, so I won't try. I'll just go into the characterization of Hex. Let me just say: What the HELL?!?!?! The whole idea of hiring a bounty hunter and having him just sit around waiting for some thugs to drag the prey to him is absolutely nuts. We should have seen Hex on the rooftops attempting to track Batman down. But since this is a Batman title, he gets all the glory and everyone else stands around letting Batman be all spooky and stuff. Hex just working for the cash is nice, especially shutting up when Savage tells him that he can have money or answers. Jonah shooting Batman in the end seemed appropriate, since he did have a score to settle for the batarang in the arm. And i did like the idea of Hex ending up with Napolean Bonaparte's gold, but it is very unclear as to why it's on the ground in the end. The artwork was murky and made it hard to follow the story. 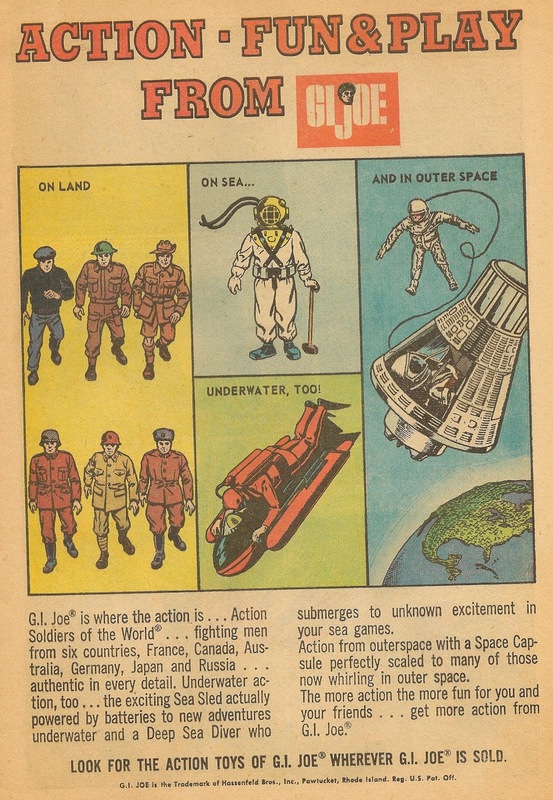 The previous issue had art that I could follow, even though I didn't know the whole storyline. I would give this about a 3 out of 10 for a Hex appearance, not great and Hex didn't do much, but it was better than his appearance in Swamp Thing.